This blog talks a lot about the importance of quantifying things — using numbers to abstract from the details of experience. What I rarely add in sentences like that is that there is a purpose to such abstraction: to find meaning deeper than the surface impressions with which we begin. Soulless thug that I am, I had never come across it. Hearing it in that squeaky seven-year-old voice, I found it captured precisely the idea I have labored to express. Numbers are generous, in that “they are willing to count anything or anyone.” All I’m asking is that we embrace such kindness. National Poetry Month it is…so enjoy. Originally published in Poetry magazine, Volume CLXXVI, Number 3, June 2000. 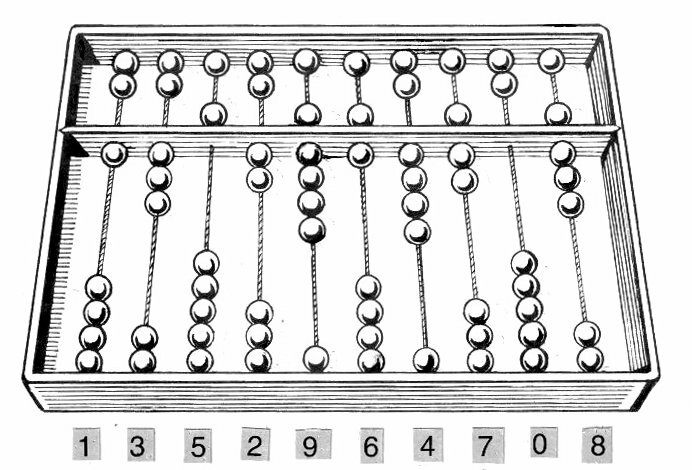 Image Person Scott Foresman, “Abacus,” copyright donated to the Wikimedia Foundation. This entry was posted on April 15, 2008 at 10:19 pm and is filed under words mattter. You can subscribe via RSS 2.0 feed to this post's comments.